Game ini merupakan game kart racing yang mengambil setting F1 driver yang dipoles menjadi kartun . tapi game ini tidak seperti game-game kart racing anak-anak lainnya seperti mario kart , ctr dll . game ini akan lebih mengenalkan situasi balapan F1 kepada anak-anak . misalnya fitur DRS , Kers lalu Pit Stop yang harus dilewati saat mobil banyak damage. kemudian tidak adanya powerslide yang membuat balapan menjadi lebih real. Race circuits that take inspiration from the most exciting tracks from the 2012 FI FORMULA ONE WORLD CHAMPIONSHIP . FORMULA ONE becomes a fantasy racing theme park featuring jumps , multiple-routes , shortcuts , and more. Game modes include Free Play so gamers can dive straight into their favorite events and Time Trials where players can set the best time in their household , download friends ? ghost cars and climb online ladders in a test of flat-out speed on every track . 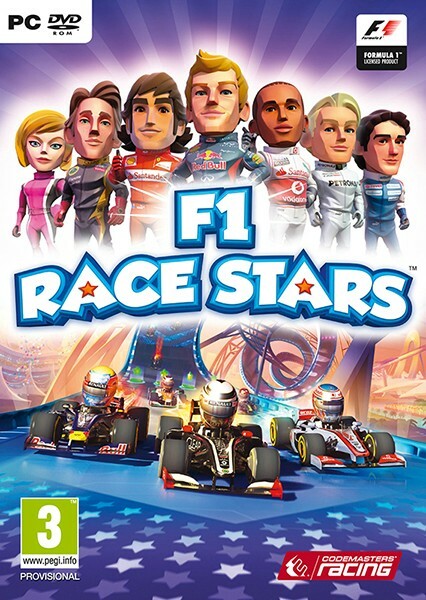 In F1 RACE STARS , the whole cast of FORMULA ONE stars become personality-packed , toonified heroes driving all-new F1 RACE STARS cars representing each team from the 2012 FIA FORMULA ONE WORLD CHAMPIONSHIP on a range of super-fast , feature-packed circuits. With up to 4-players competing in split-screen multiplayer , head-to-head competition or coming together in teams , F1 RACE STARS is perfect for sharing the fun with friends and family. Up to 12 players can also race in online multiplayer and by signing up to RaceNet , the free online extension for Codemasters Racing games , players can track their races , rivals and rewards and join in regular F1 RACE STARS community events. Additional : Supported Graphics Cards: AMD Radeon HD2600 or higher , HD3650 or higher , HD4550 or higher , HD5000 Series , HD6000 Series , HD7000 Series . nVidia GeForce 8600 or higher , 9500 or higher , GTX220 or higher , GTX400 Series , GTX500 Series , GTX600 Series . Intel HD Graphics 3000 or higher , AMD Fusion A8 or higher. Note: Not compatible with all integrated sound/graphics solutions (inc . Laptops) . 2 Responses to "F1 Race Stars Single Link ISO Full Version"